ConvertMe Swing-2-Seat Portable Swing - Moreland is rated 4.1 out of 5 by 19. Designed with parenthood in mind.™ Ingenuity™ ConvertMe Swing-2-Seat™ in Moreland™ is two amazing seats in one! This swing converts effortlessly to a seat with soothing vibrations. 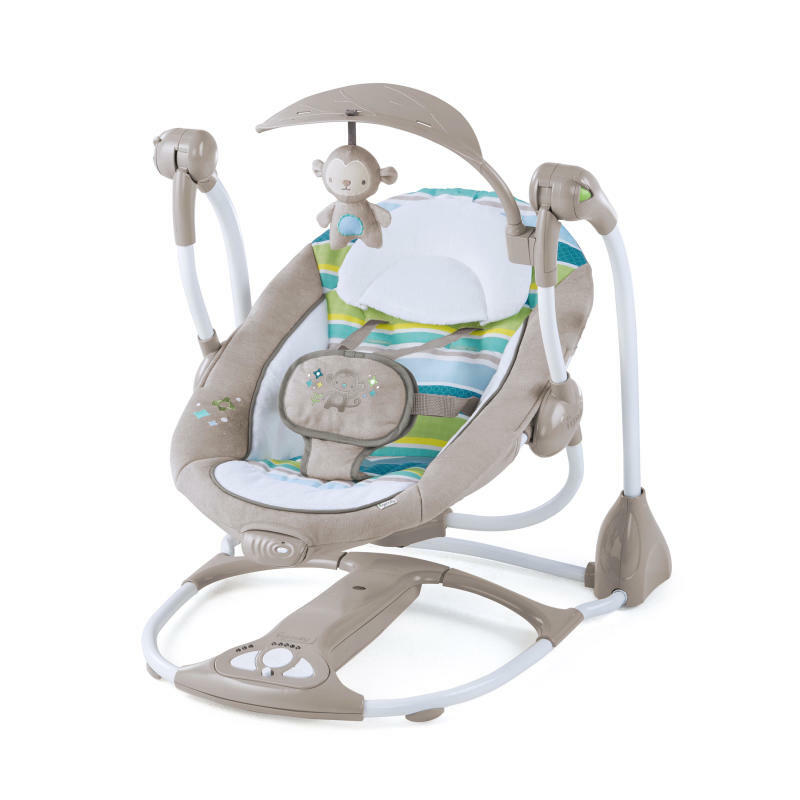 Entertain baby with 5 swing speeds, 8 melodies and 3 nature sounds. A pivoting leaf-like toy bar offers 1 adorable plush toy and 3 slots for attaching more toys. The tasteful Moreland™ fashion is rich with embroidery and detailed embellishments. Perfect for a girl or boy. You'll save money on batteries thanks to Hybridrive™ Technology. Your batteries last up to 3 times longer. Our SlimFold™ design allows the swing to fold flat for easy storage and transport. Swing timer has 3 settings: 30, 45 and 60 minutes. WhisperQuiet™ technology allows baby to swing in near silence. 5-point harness and non-slip feet for security. Seat pad and head support are easy to clean. This portable, convertible swing features neutral, modern fashions and deluxe features that make life easier for mom and relaxing for baby! Dimension (in) 22" x 23.5" x 23"
Seat pad and headrest - Machine wash with cold water, gentle cycle.Toy bar and toys – Wipe clean with a damp cloth and mild soap. Air dry. Do not immerse in water.Frame – Wipe the metal frame with soft, clean cloth and mild soap. Rated 1 out of 5 by Debbie from Doesn't work I received this brand new for my baby shower. I was used only once before it quit working. Now I have no receipt nor swing or bouncer. I'm not sure if the manufacturer will replace but I'm going to try. Rated 4 out of 5 by Dorothy from portable and compact Love how it was easy to assemble and it takes up little real estate, which is crucial with condo living! Love how it has the option to be a swing or a vibrating seat. Not a fan of how it is only battery-operated. Would have liked it to have the option of being plugged in. Rated 5 out of 5 by Katlyn from Best swing by far! This is by far the best swing we have used. After receiving 3 and trying them all this is the most convenient. Being able to move it around the house with ease made dealing with postpartum a breeze! Rated 5 out of 5 by Ifmou from Great features Easy to assemble! Doesn’t take up much space at all! Rated 5 out of 5 by Ifmou from Great features Easy to assemble! Doesn't take up much space at all!